Finding a replacement not a simple matter. Mercedes-Benz and Lexus nix any suggestion that they want the gig. It's been common knowledge throughout motor sport but now a press release from V8 Supercars Australia has confirmed the news that Nissan has ended its safety car deal with the category after only a few months, the split caused by V8SA's insistence on placing alcohol signage on the GT-R.
V8 Supercars Australia and Nissan Australia have reached agreement to end their partnership, in which Nissan provided the official Safety Car for the Championship Series. 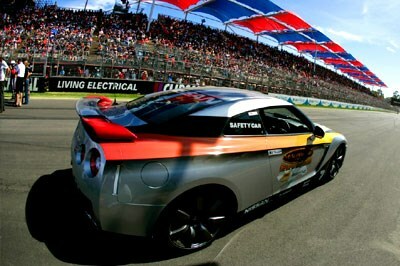 Nissan fielded the world class Nissan GT-R as the official safety car for the first four events of the 2009 V8 Supercar Championship Series with great success and exposure for both brands. Nissan, still a little stunned by developments, says it look forward to exploring new roles for Nissan in the Australian motorsport spectrum. The search for a replacement goes on. Initially it was thought that HSV could fill the breach but one media outlet has suggested that Holden is not prepared to be associated with alcohol either. Safety and grog are not considered a great mix. Lexus has confirmed that it has been approached by V8SA marketing people but advised them in no uncertain terms that the brand and V8 Supercars is not a good fit. The Mercedes-Benz PR chief David McCarthy was even more colourful in rejecting suggestions that an AMG product should pace the Ford and Holden field. "It wouldn't be very sporting if an AMG safety car - a road car - was faster than the race cars, would it?" McCarthy responded. "If V8 Supercar executives wish to drive an AMG product, perhaps they should buy one - Id be happy if they were to give me a call."